It’s been a while since I last made a Wine Bottle Drip Candle, but I couldn’t resist trying it one more time after spray-painting two Mateus wine bottles in candy corn colors. I recycled one bottle into a Candy Corn Vase and found I really liked the cheerful combination of yellow, orange and white. The second bottle seemed like a natural for making a drip candle, also in candy corn colors, for either Halloween or Thanksgiving decorating. CAUTION: This is not a child’s craft, and children should not attempt any part of this craft project. Adults should take safety precautions seriously and never leave a lit candle unattended at any time. (made specifically for dripping down) are really good, but you can also make do with what you have. Check local thrift stores! Most have lots of candles, often discarded by people who prefer candles that don’t drip, ergo, good news for you. 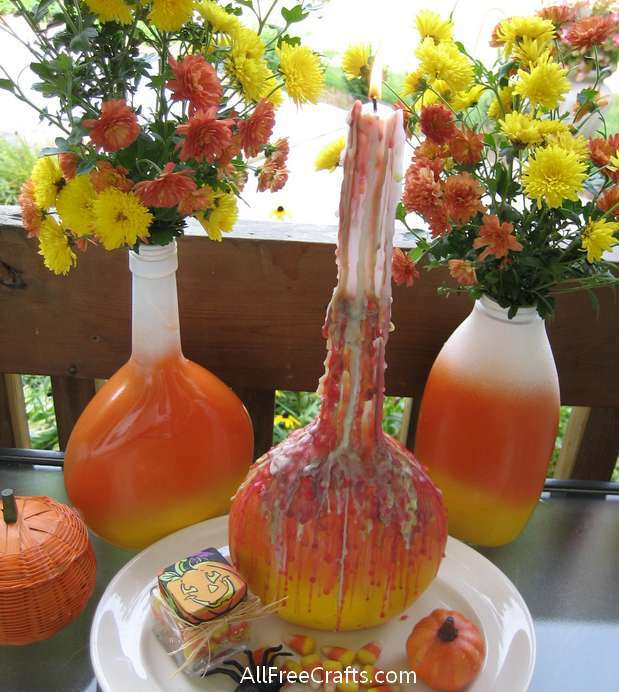 Spray the wine bottle in progressive yellow, orange and white stripes, following directions in Spray Painted Candy Corn Vases. Take a tall wax candle in one of the three main colors and insert it firmly into the wine bottle. If the candle won’t sit firmly, taper the bottom inch or so, shaving it with a penknife or paring knife until the candle can be placed securely in position. 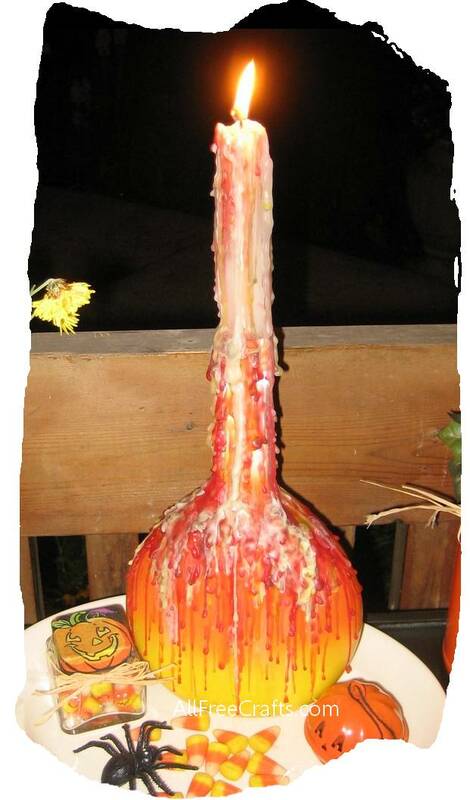 Allow the candle wax to drip down the sides of the wine bottle. If one section is becoming too coated with wax, while other areas are too bare, remove the candle, rotate, then place it back in the wine bottle in a new position. You can hasten the process of coating the bottle with wax by holding small birthday candles, in the right colors, either up to the flame of the main candle, or holding them in a dripping position, farther down. 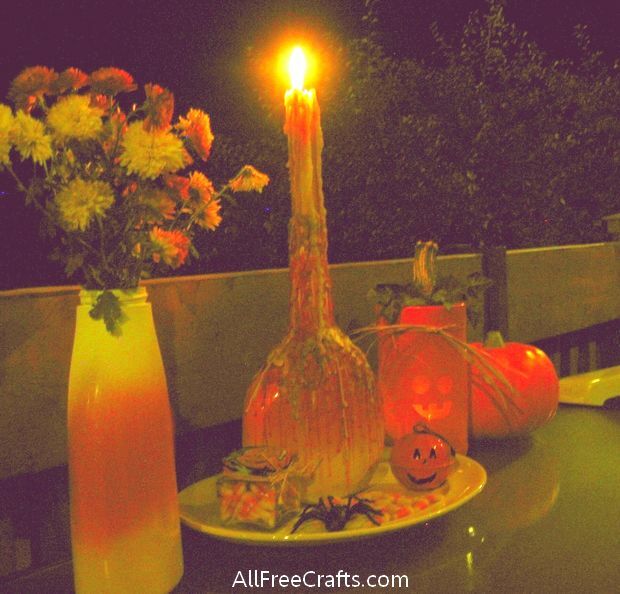 Larger candles can also be used in the same way. Variations: Go with black-and-white for Halloween, instead of candy corn colors. 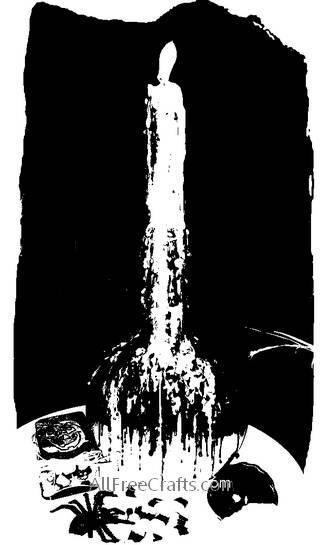 Spray paint the wine bottle black, then drip thick rivers of white wax down the neck and shoulders of the bottle. A little blood red on top wouldn’t hurt, either. During parts of this craft project, you are doing what mom always told you NOT to do: namely, playing with fire. Be sensible. Work outside, if possible, away from other flammable objects and in a spot where fire can be easily and quickly controlled. A ready supply of water is essential. Have a watering can full of water nearby or a water hose ready to spray. Chances are, you will never need it, but better safe than sorry.